Presair offers a wide variety of garbage disposal button finishes to match any kitchen decor. 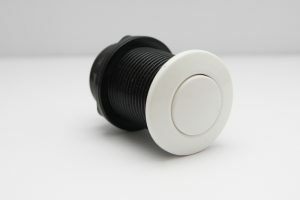 Our standard garbage disposal button is available in white, chrome or brushed nickel. We also offer a wide variety of custom finishes such has oil rubbed bronze, brass and more to meet the needs of any decor. A garbage disposal air switch is a device that provides you with a convenient way to engage your garbage disposal. A garbage disposal air switch requires no electricity to be connected to it so it is easy for the majority of people to install in their home. The garbage disposal button connects to an 8ft piece of air tubing which leads to an air switch. When the garbage disposal button is pressed, it activates the air switch turning your garbage disposal on/off. The button is mounted on the cabinet top, making it a safe and convenient alternative to the wall switch. Because the air switch works from air pressure, there is no electricity at the point of actuation reducing the risk of shock. The garbage disposal air switch is designed to be compatible with most brands of garbage disposals (max 15 amps), making installation easy! And to make it even more easy, we’ve included a simple how to guide below.